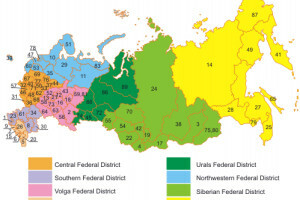 A major reason Russians in the regions are furious at Moscow for viewing their territories as nothing more than suitable sites for trash dumps is that many of them fear that the country’s leadership is quite happy with a vision of Russia’s future in which there will be 25 big cities surrounded by dumps and connected by pipelines. That vision is widespread and reflects both the long-term emptying out of the Russian countryside and ever more frequent talk in Moscow about “agglomerations” as the best way to organize the country in the future (newsland.com/community/129/content/budushchee-rossii-25-aglomeratsii-ostalnoe-truboprovody-i-musornye-poligony/6710231). There is just enough truth behind this vision to convince many that it is the case or at least it is Moscow’s intention – Newland has assembled maps showing the concentration of population in the big cities and the rise in trash dumps everywhere else as well as commentaries promoting these trends. As a result, ever more Russians fear Moscow doesn’t care about them. That sense of being ignored, of being passed over, and of being slated for oblivion can be a more powerful motivating force than almost anything as political developments in many countries in recent years have shown. And it, more than anything else, is changing the passivity of many in rural Russia into activism. Whether this activism can be sustained and connect with political leaders in the center remains to be seen, but it is definitely a force capable of transforming the political system of Russia in much the same way that traditionalist and anti-globalist forces have in the United States and Western Europe. And this trend raises the question as to whether the future of politics in that country will feature a Russian version of Donald Trump, someone who plays to the fears of those who think they are held in contempt, are ignored and are left out of the elite’s vision of the future, rather than to liberal opponents of the current regime or an even more Stalinist leadership. Vladimir Putin has on occasion played to aspects of this anger, but he is now far more associated with those who are acting in ways that generate it rather than reflect it. Consequently, it is far more likely that someone else will pick up on the anti-intellectualism that is the core of such complaints. One of the criticisms of this attitude made by Lenin and others on the left is that such populism focuses on cultural questions and thus allows elites who exploit it to deflect the attention of the lower classes away from their own economic oppression and thus allow elites to exploit them all the more easily. For a useful discussion of Machajski’s writings in Russian, see Albert Parry’s introduction to Machajski’s writings collected and republished as Umstvennyy rabochy (New York, 1968); and for parallels between this trend in Russia and developments in the West now, see windowoneurasia2.blogspot.com/2017/11/another-thing-putin-and-trump-share.html.